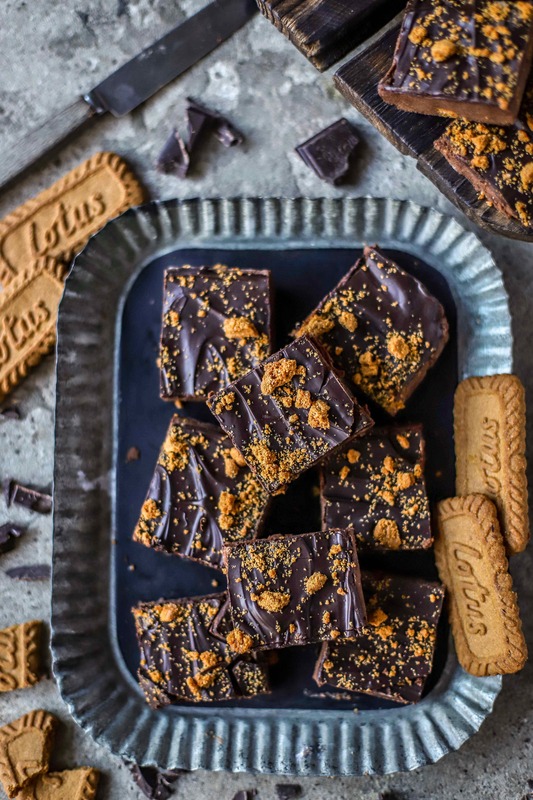 This Chocolate Truffle No-Bake Cake is studded and topped with delicious caramelised Lotus biscuits, and is perfect to make with the children. Totally vegan, it has no extra added sugar but does have two surprising whole food ingredients. I hope your Christmas, whether snow-bound or sun-kissed, was merry and bright. Here in Edinburgh it was way too warm for snow (mid-50s), but we donned our elf ears and felt reindeer antlers and pretended it was a white Christmas anyway. We rarely get a snow here on the east coast, so we were very happy that it was gloriously sunny and not sloppy, sleety rain. I’m sure that will be coming…. We started the festive, happily fair, day with a portable brunch feast that we took to Andrew’s great aunt across town. Everything was ready to go straight into her old gas oven. I had even remembered to bring baking trays, condiments and little platters. But we couldn’t get the oven to light! Thinking on our feet, and not wanting to disappoint the rumbling tums in the next room, Andrew and I managed a combination of broiler and stovetop heating. It felt like fancy camping, with only a few things lightly singed. A new tradition, perhaps? Later at home, my cauliflower and porcini Wellington was the edible table centrepiece at dinner, and the star of a few Facebook pictures by my mother-in-law, Ann. Apparently some of her friends were in disbelief that one could Wellington a cauliflower. But we did! Did you make it, too? If not, I think it might also be fab at a New Year’s Day lunch – if you aren’t already tempted by the oddly-named but awfully delicious bean stew, Hoppin’ John , which we Southerners eat for good luck with soft, golden cornbread. I also have a jerk-spiced version, too. On New Year’s Day itself we often have homemade blinis with Scottish dry-cure smoked salmon, with plenty of dill lemon and crème fraîche. This year I will also be making them with this vegan Beluga lentil “caviar”. I can never make enough blinis, however they are topped: they disappear in no time. We also have them on Christmas morning, with this refreshingly crisp Crémant de Loire (a not-too-shabby Champagne-alike). I need to remember to go to Sainbury’s today for a re-stock! We have pretty much polished off the Christmas leftovers, save for a bit of roasted lemon-dill salmon. This has been repurposed into salmon and quinoa burgers, studded with chopped gherkins, with yet more dill, my own Scandi pepper blend, and an egg to bind. It is waiting in the freezer for a suitably hectic day, when otherwise a trip to “the chipper” (fish and chip shop) might tempt. That may happen anyway. After a brisk beach walk not much beats ripping open a paper parcel of fryer-hot fish and salted, vinegary chips/fries, diving in with frosty fingers. Today’s recipe is keeping up the festive theme, but is more on the wholesome side of the sweet table. This no-bake cake is of course not a true cake, but I didn’t know what to call it. Not only is it delicious, it is very easy to make with your kiddo helpers. If you fancy something that feels special but doesn’t weigh you down, this is just the gently sweet treat to make. With or without “help”. So, what’s in this chocolate truffle no-bake cake? Five ingredients. Yep, that’s all you need to make this cake. On first glance you make think, “hell no”. Please trust me. I’ve been making a baked version of this for many years and I always get asked for the recipe. Here is the recipe for it, my Chocolate Chestnut Truffle Cake, in case you want to make an actual cake version of the no-bake – albeit a non-vegan one (contains eggs and butter). Lotus biscuits! If you don’t have Lotus biscuits, why not try ginger snaps, digestive biscuits, graham crackers, or any light, caramelised-type cookie. How do I make the cake? Essentially it is just melt the chocolate and fat, whizz it up with the prunes and chestnuts, then stir in the crumbled biscuits. You then press this glossy brown modge into a clingfilm-lined pan chill and patiently wait two hours for it to set and get all moussey-textured. There really isn’t much more to it, but it tastes like you spent ages making it. And, because there are no eggs or uncooked flour, you can lick the bowl clean! Remember to follow me on Pinterest and, if you make my No-Bake Chocolate Chestnut Cake, click on the pin below the recipe card and leave a photo of your make with a comment telling me what you think, or any awesome changes that you made. Similarly, any Instagram posts tagged @food_to_glow using my recipes will go on my Story if I see them. I’m always so proud when you share my recipes with the world. Yay!!! Whether on Pinterest, Instagram, Facebook, Twitter or of course here on the blog, I love to see what you do with my recipes, and I welcome your comments, star ratings, tweaks and suggestions. Does this sound like a nice easy non-baking project to you? What other foodie plans do you have over this festive time? Do you have any snow?? This Chocolate Truffle No-Bake Cake is studded and topped with delicious Lotus biscuits, and is perfect to make with the children. Totally vegan, it has no added sugar but does have two surprising whole food ingredients. Bring 200 ml of water to a low simmer in a bain marie or double boiler and melt the fat and 100g of the dark chocolate. When the fat and chocolate have melted pour them into a food processor or blender. Now melt the rest of the chocolate and keep to the side in the pan. Add the prunes to the hot water from melting the chocolate and leave to soften for 10 minutes. If your prunes are very soft you can skip this step. Drain and add to the food processor. Add in the chestnuts/chestnut puree and blend until just mixed through and a glossy brown. Scrape this mixture into a mixing bowl. Add in most of the crushed Lotus biscuits, saving some for the top. Line a square tin with cling film and scrape in the chocolate "cake" batter. Use another piece of clingfilm to press it down evenly, using the side of your hand to level it. Remove the top piece of clingfilm and pour over the waiting melted chocolate, and sprinkle with the remaining Lotus biscuit crumbs. Cover the top of the tin with a clean piece of clingfilm and pop in the fridge for 2 hours. To serve, lift the clingfilm to release the cake. Peel away the film and cut into even pieces with a warm knife (I wave mine over a gas flame). Store the cake in the refrigerator for up to five days. You can of course make this no-bake cake with dairy butter (this is the most tasty way to make it imo). If so, use 50g of unsalted organic butter. The UK is great for affordable, easy to find choices in vegan chocolate. In general dark chocolate as opposed to milk chocolate tends to be dairy-free, but do check the label if you need to make sure it is vegan. Best brands to look for in the UK are Sainsbury's Basics (cheapest choice), Green & Black 75%, Seed and Bean brand, Moser Roth (Aldi), Finn Carre dark chocolate (Lidl), Waitrose own brand dark chocolate. The prunes in this are a great idea. So sweet and rich but healthy!! Love your new animation on how to make it too. You are awesome!!! Happy and Healthy New Year to you and yours, dear Kellie! Holy cow these were amazing. Kellie you’ve outdone yourself again. How did you think up this dessert? The only change I made was to sub almond butter in for the chestnuts. Will definitely be keeping these in the rotation. I love your notes on your festive days and well done you two for your quick thinking stove top cooking. What a great recipe so dark and tasty looking and I love prunes so can just imagine this combo, lovely!